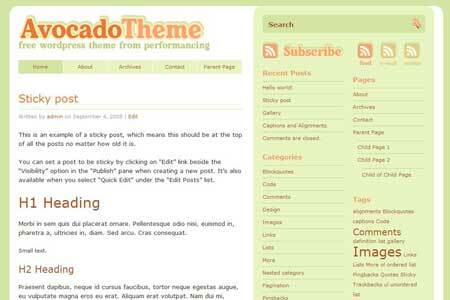 Performancing Themes has released its latest free theme for WordPress: Avocado Theme, designed by Ia Lucero. Green is the in thing today. We do want to save the Earth and the human population from a radical change in climate. The Avocado Theme reflects this philosophy, both with the green-themed color scheme, and with how the editorial and design team of Performancing strive to be green in the way we live and work. The Avocado Theme uses a three-column layout with rounded corners. The green-dominated background and sidebars are highlighted with orange headers and icons. The theme is optimized for use with WordPress 2.8 and above, and supports various features like threaded comments, post classes, image captions, galleries, and drop-down menus. We have included in the theme ZIP file the Photoshop file and font used for the header, should you wish to use the header image for your title or logo. The Avocado Theme is a classic theme release from Performancing Themes for WordPress, and is another collaboration with designer Sophia Lucero, who has likewise designed other themes, like Too Newsy and Rubidious.